While a certain Democratic ex-President has been trying to exploit the memory of today’s terrible 15th anniversary to take a political cheap shot at millions of Americans, I prefer to commemorate a different anniversary. Two hundred thirty-five years ago today, American patriots at Lexington and Concord ignited the cause of liberty on American shores. 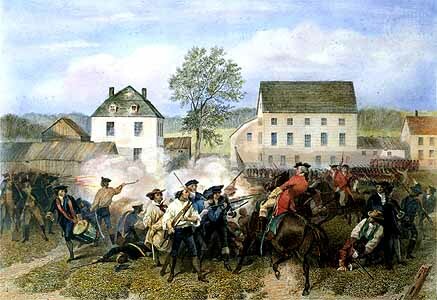 What was nearly unthinkable on April 19, 1775 — a ragtag band of Patriot colonists winning the hearts and minds of many countrymen, the support of the French crown and securing independence from Britain — eventually came to pass. If you’re inspired to learn more, I recommend David Hackett Fischer’s classic Paul Revere’s Ride. Separate the legend from the history, and still find that there is a lot to marvel about. Today’s Tea Party Patriots have access to ballot boxes to defend our rights. But the historical lessons of courage and fortitude and fealty to liberty that reared their head some 235 years ago today are well worth recalling.